Penned by one of the leading writers of suspense in the early 20th Century, Gaslight made its mark as a chilling psychological thriller on stage and screen in the 1940's. Now a revival of Patrick Hamilton's play Gaslight is back in theatres and opened at Birmingham's New Alexandra Theatre for the start of its UK tour, which will continue on to venues including Brighton's Theatre Royal and Richmond Theatre near London. While this production is still set in Victorian London, it has also been injected with touches of humour to adapt it to a modern audience. It ends up making the play a mixture of many things but not one or the other. It's part mystery, part comedy and lashings of relationship melodrama. It's in a gloriously lavish sitting room that we find young downtrodden wife Bella. Former EastEnders' actress Kara Tointon is at the centre of the action as this frightened and confused woman who thinks her mind is playing tricks on her. She's tormented by things going missing and notices how the gaslight lamps dim suddenly at night when her husband Jack ( Rupert Young from BBC1's Merlin) isn't around. 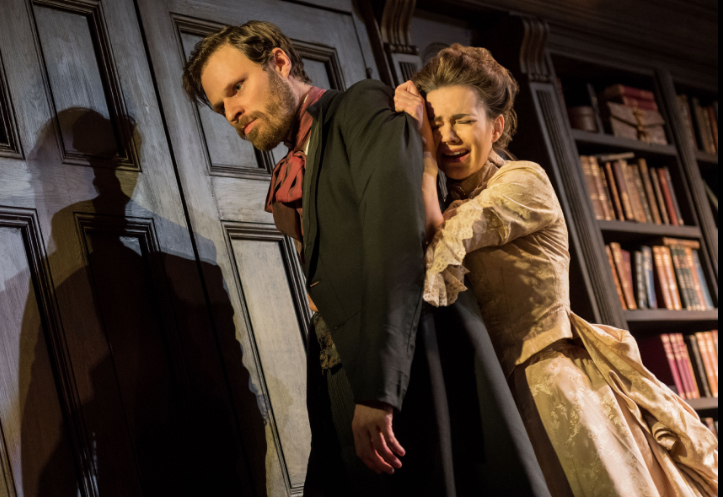 It's no easy feat playing the Bella role as it was made famous in the 1944 movie version by legendary Ingrid Bergman, but it helps that this stage version of Gaslight is slightly different to the film. There is still plenty of drawn out tension though, for those fond of the movie. Director Anthony Banks also makes as much use out of the silent moments as he does those that are scripted. The long drawn out pouring of milk into a glass, the chiming of a clock and even the dropping of sugar cubes into tea all are extended to add suspense. Tointon, who has become as well known for her stage roles as TV characters after parts including Eliza Doolittle in Pygmalion is well cast with both an air of vulnerability and an edge of determination. Her clipped pre-war accent makes her reminiscent of Celia Johnson in Brief Encounter. Tointon is still only 33 but has become so in demand since winning Strictly Come Dancing in 2010 with Artem Chigvintzev that she can be seen somewhere at most times and is currently also starring as a jazz singer in new ITV drama The Halcyon. This role will only add to that buzz around her. 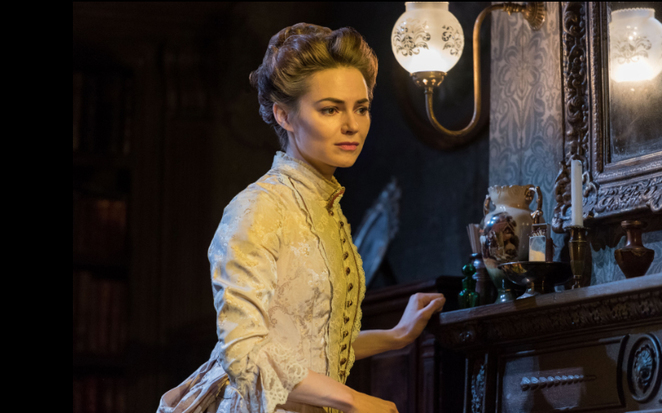 Rupert Young from Merlin with Kara Tointon in Gaslight. There's more to just Tointon as alongside her is veteran actor Keith Allen as police detective Rough, who is thrust into Bella's life to shed light on her Victorian home and reveal a past of murder and missing jewels. Allen breathes life and soul into the drama after an initial slow start. From the moment he enters the story, after about 20 minutes, the tempo speeds up, as do the comedy elements. Tointon may be good but Allen is the one that lights up the stage, but that's partly because he's blessed with such a vibrant character in the plot. It's ultimately Tointon and Allen's chemistry together, albeit sometimes tongue in cheek, that makes this production work so well. Young, playing husband Jack, is a world away from his gallant Sir Leon character in TV show Merlin as a brutish bully. He has a real presence on stage but then he's no stranger to theatre, previously receiving praise for his role in in Cole Porter's High Society at the Old Vic as well as starring in While The Sun Shines for Bath Theatre Royal. Hamilton wrote this play (called Angel Street in America) in 1938 when it was groundbreaking for its time. He also went on to write thriller Rope, which became one of Alfred Hitchcock's classic movies. For those familiar with Rope, this story has those same elements of tension and made such an impact at the time of its creation that it also spawned the term "gaslighting" when referring to a form of psychological abuse. But it is also very much a play of its time and is in some ways a little dated. It's interesting that this production has decided to err on the side of lightheartedness rather than go for a deep, dark chilling noir. With a strong cast, a memorable set and some tense moments, Gaslight is an enjoyable and interesting thriller of old, even if it doesn't have the shocks and red herrings that modern audiences have become so accustomed to. Tickets cost from £18 - £52 and are available from the ATG theatre website. March 14 – 18 - New Theatre, Cardiff. Gaslight is produced by Ambassador Theatre Group and Smith and Brant Theatricals.